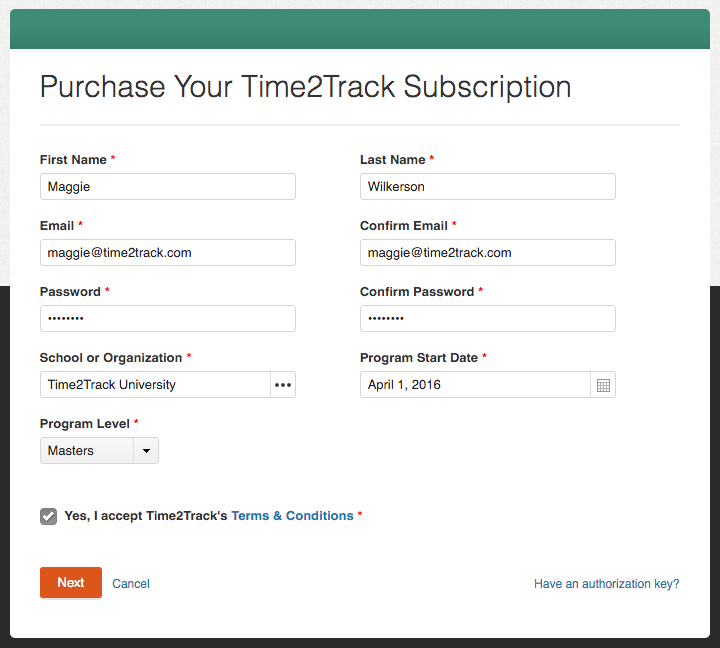 The Time2Track Individual User Guide will help you with the basics of getting started with Time2Track and connecting with your school or program (if they're using Time2Track too). This guide is geared specifically for doctoral psychology students who will be applying for an internship through APPIC. We recommend watching this video before you get started with Time2Track. It covers the basics of how Time2Track works and explains why you're tracking hours in the first place. It's 10 minutes total, but feel free to skip to specific chapters using the menu on the left. Time2Track helps you track and organize your clinical training and work experiences. It’s our job to make your life easier so you can spend less time tracking your hours and more time doing other stuff. Why do I need to track my hours? As a student, intern, postgraduate, or professional, you’ll be required to track detailed information about your clinical training and work experiences. This information will be used to complete your educational program’s requirements and when you’re applying for an APPIC Internship, jobs, state licensure, and credentialing. You’ll need to keep track of your practicum, internship, postgraduate, and professional experiences, and you can do all that in your Time2Track account. APPIC is the organization that matches doctoral psychology students with internship sites. After you complete your practicum training, Time2Track calculates the numbers you need to complete the clinical training experience portion of the APPIC Application for Psychology Internships, or the AAPI. Getting matched to an internship can be a stressful process, but Time2Track makes it easy to keep track of your progress and stay on track. Visit www.appic.org for more information about APPIC and the AAPI. If you don’t already have a Time2Track account, you’ll just need to create one. 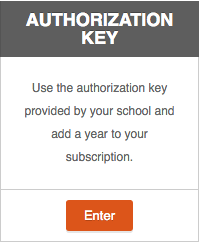 If your program sent you an authorization key, that means they have purchased a Time2Track subscription for you. Follow the steps below to set up your account and connect to your program. Click here, then complete the form with your information. Enter your program’s Authorization Key. You should have received this from your program – if not, contact them for your program's key. If your program didn’t send you an authorization key, that just means that you’ll purchase your own Time2Track subscription. Enter your information and make sure to select the correct program listing as your School or Organization. If your program is using Time2Track, you should have received an email from them with the exact name. This is what connects you to your program’s Time2Track account, so it’s very important that it is correct. If your organization isn't listed and you're using Time2Track as an individual, just choose No School from the list and contact us to have your organization added. Follow the prompts to select your Time2Track plan and enter your payment information. 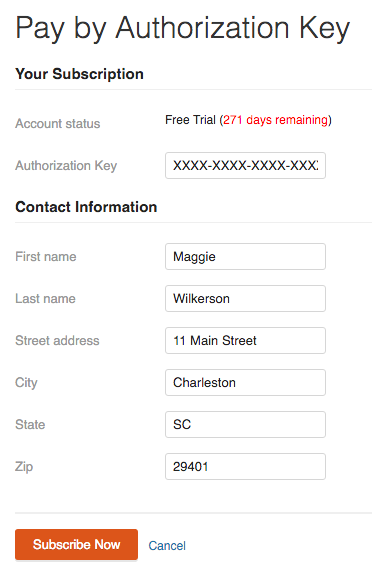 If you already have a Time2Track free trial or paid account, don’t worry – you can connect your current Time2Track account with your program. There’s no need to open a separate account. 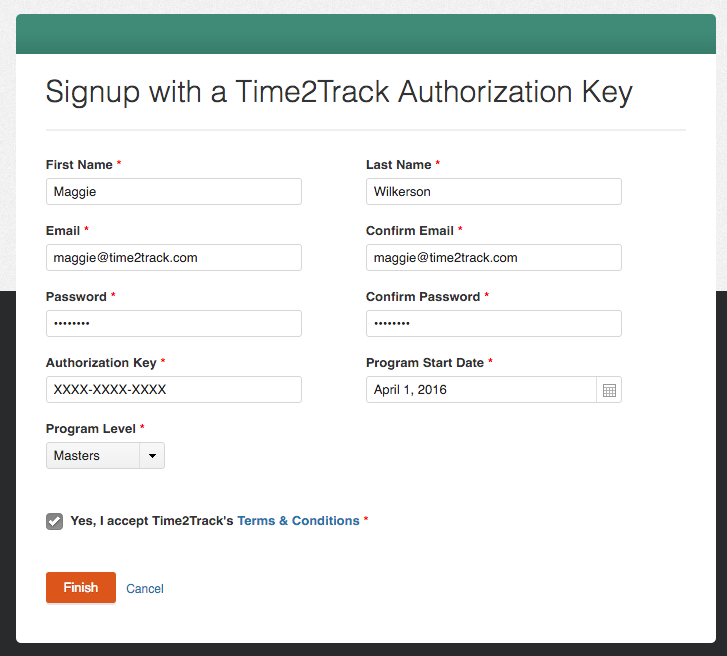 If your program sent you an authorization key, that means they have purchased a Time2Track subscription for you. Follow the steps below to add the new subscription to your account and connect your account to your program. Sign into your current Time2Track account here. Click Subscription under the gear icon in the top right corner. Select the Authorization Key option. Fill out your Contact Information, then click Subscribe Now. Click the gear icon in the top right corner, then click Profile. Change your School to the correct program listing. You should have received an email from your program with the exact name. This is what connects you to your program’s Time2Track account, so it’s very important that it is correct. If you have not yet purchased a Time2Track subscription, click Subscription under the gear icon to purchase. Before you get started logging activities, you need to check if your program is using Online Approval. At the top of your screen, you should see some tabs starting with Activities. Don’t see an Approvals tab? Click here to skip this section. Online Approval is currently available only to individuals whose programs use Time2Track. Do you see a tab called Approvals? If so, that means your program is using Online Approval, so you can continue on to setting up your placements below. Now that we know your program is using Online Approval, you need to set up a Placement. In Time2Track, a Placement refers to training or work experiences like practicums, field placements, externships, internships, rotations, jobs, or other types of experiential training. Select the appropriate Level, Course, Training Site, and Term, then indicate your Preferred Supervisor – this will be used as your default (you can always change it later). 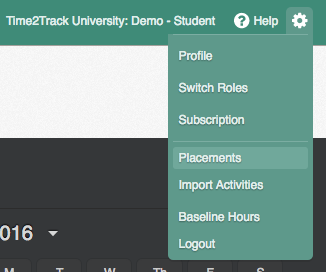 If your organization has faculty members using Time2Track, you’ll see a place to choose your Faculty (e.g., advisor or instructor) for that placement. This will give your advisor or instructor access to your hours for that placement. If you’re training at multiple sites, go ahead and add separate Placements for those as well by following the steps above. Keep in mind that the options you see for Course, Training Site, Supervisor, and Term are added by your program. If you don’t see the option you need, contact your program’s Time2Track Administrator and they can add it for you. 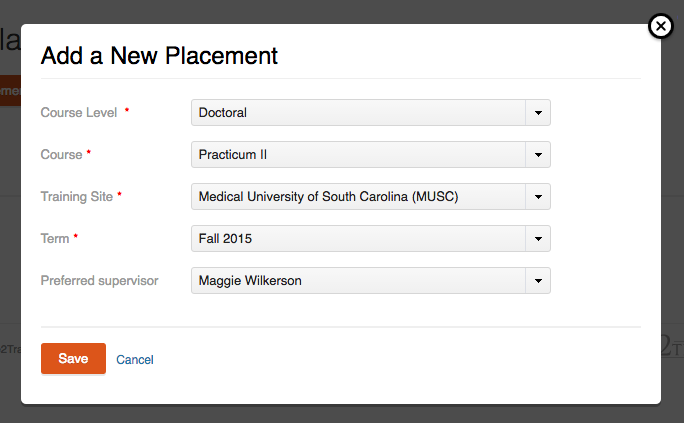 If your Placement spans several Terms, you'll need to add a separate Placement in Time2Track for each Term. This helps your institution with better reporting capabilities. 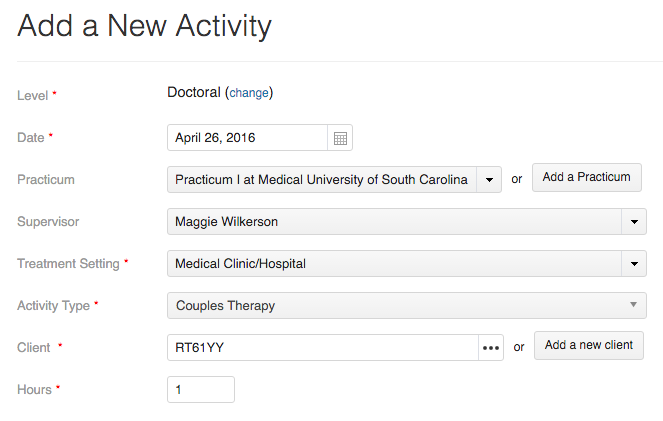 Time2Track lets you customize your Activity Types and Treatment Settings so you can better define your clinical experiences. 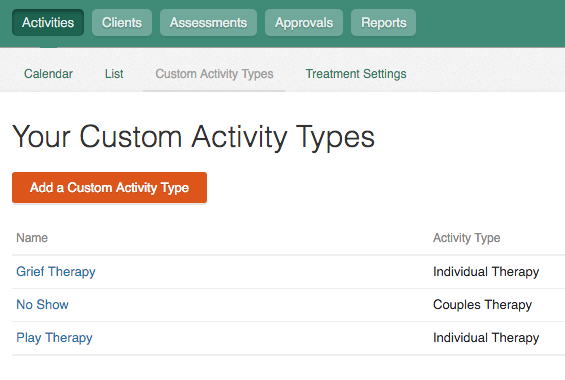 You can add some custom activity types and treatment settings now, or add them at any time. 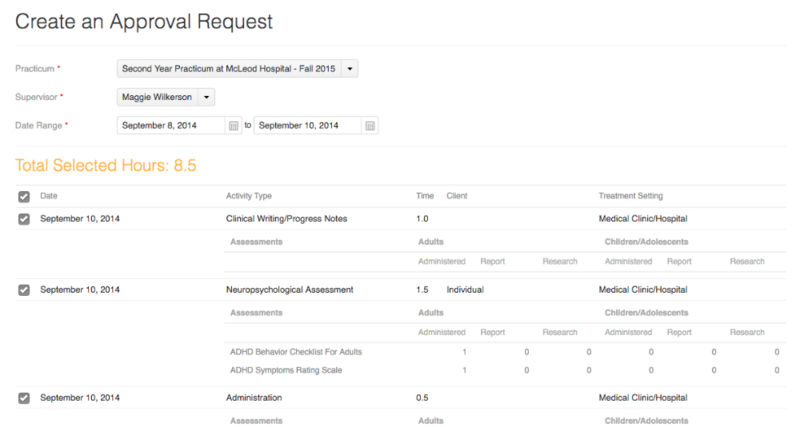 Custom activity types are great for further describing your clinical experiences. For example, if you’re performing a specific type of therapy like Grief Therapy or Play Therapy, you can add those as custom activity types in Time2Track. Click the Activities tab, then Custom Activity Types then Add a Custom Activity Type. Name your Custom Activity Type (eg. Play Therapy) and choose a Time2Track activity type (for reporting purposes). Custom Treatment Settings are useful especially when your program is not using Online Approval. You can use Custom Treatment Settings to keep track of your specific training sites and supervisors for reporting purposes. Click the Activities tab, then Treatment Settings, then Add a Treatment Setting. Name your Custom Treatment Setting. You could use something like “Charleston General Hospital – Mental Health Clinic” or you could include your supervisor’s name like this “Charleston General Hospital – Mental Health Clinic – Sigmund Freud”. Choose a Time2Track setting type (for reporting purposes). Now you’re ready to start logging your clinical training and work experiences in Time2Track. In Time2Track, clinical and work experiences are called Activities. An Activity contains details about your experience, including clients and assessments. To add an activity to Time2Track, you just need to fill the details of what you did. Some of the fields will be “remembered” by Time2Track the next time you add an activity to make things even faster. You can always change those fields if needed. Go to the Activities tab, then click Add a New Activity. Enter the details of your activity. **If your program is using Online Approval, you’ll see fields for Placement and Supervisor. 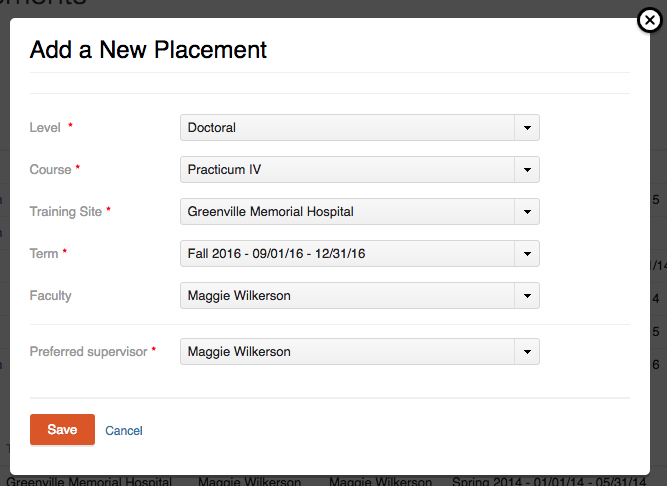 Your supervisor will default to the preferred supervisor you chose when you added your Placement, but you can change it for individual activities if needed. Add your Client. A client can be an individual person or a group of people like a couple, family, or group. 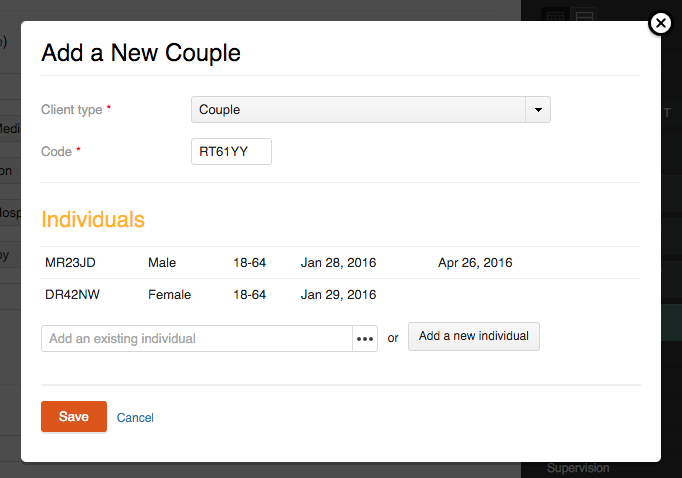 You can add members of a couple, family, or group to Time2Track as Individuals, then group them together appropriately. Check out the Clients tab for more advanced client management options. Hours are entered in decimal format. For example, 15 minutes is .25, 30 minutes is .5, and 45 minutes is .75. Add any Assessments you administered during this activity. 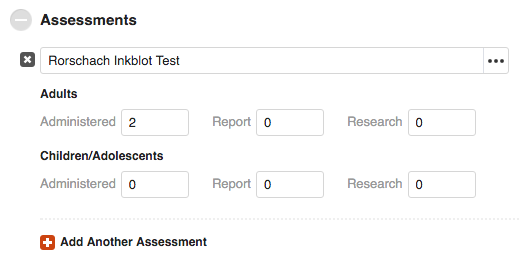 You can start typing to search our database of assessments, or continue typing to add your own. Click Add or Add and Enter Another. If you have activities that occur at regular intervals, you can add these to Time2Track as recurring activities. For example, if you have group supervision every Friday at 2:00pm for 2 hours, you can add an activity to Time2Track one time and schedule it to recur every Friday. This feature saves a ton of time because you can confirm each future occurrence with just a click instead of having to enter a whole new activity. Just click Schedule as recurring when adding a new activity and add your details. In the Calendar view under Activities, you can confirm (or delete) any activities that were created as part of a recurring series. Just hover your mouse over the activity and click the checkbox to confirm or the x to delete. In the List view under Activities, you can confirm recurring activities in bulk. Just use the filtering options to search for the activities you want to confirm, then use the checkboxes to select them. The dropdown menu under the filters gives you the option to Confirm. You can also apply other bulk changes to groups of activities, like changing the Level or adding Placement / Supervisor information. Time2Track has some safeguards built in to prevent unintentional bulk changes, but make sure you use this feature carefully. There’s no undo. 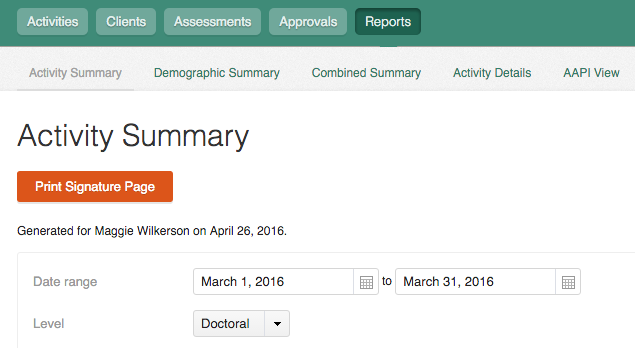 Now that you’ve logged some activities, you can submit them to your supervisor for approval online whenever you’re ready. Each Approval Request is similar to a timesheet or hour log. You can submit these as often as you like, but we recommend checking with your supervisor or training director to see if they have a preference. This option is for trainees whose programs are using Online Approval. Your supervisor won't be able to see your activities until you submit them for approval. Click the Approvals tab, then Submit Hours for Approval. Choose the supervisor you’d like to send the approval to, and narrow down the date range if needed. Select the activities you’d like to include, then click Submit Selected Activities for Approval. Your Supervisor will receive an email alerting them of your pending approval request. They can then log into their Time2Track account and review your request and choose to approve or reject it. You can resubmit rejected activities by changing the appropriate ones, then following steps 1-4 above to submit a new approval request. If you need to change an activity after it’s been submitted or approved, that activity will be removed from the previous approval request and its status will be changed to Unsubmitted. You’ll need to resubmit it as part of a separate approval request. This option is for trainees who need physical signatures from supervisors for approval, or whose organizations are not using Online Approval. Click the Reports tab, then click the report you'd like to submit for approval. The most popular report for this purpose is the Activity Summary report. Use the filtering options to bring up the activities you'd like to include on the report you'll be submitting, then click Filter. Click Print Signature Page, then take the printed report to your supervisor for their signature. When it’s time to apply for internship through APPIC, go to your AAPI View report and Time2Track will calculate the exact numbers you’ll need to complete the clinical training portion of the AAPI. APPIC requires hour and demographic totals to be calculated in a specific way, and Time2Track will do all that for you. All you need to do is transfer the numbers from the AAPI View report to the AAPI Online. It only takes about 30 minutes, and it’s helpful to double check your numbers along the way. 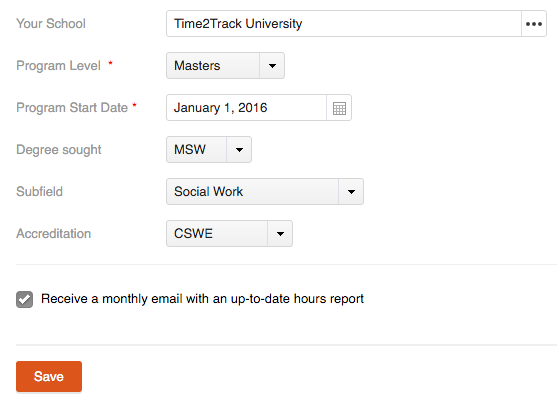 Time2Track offers several different Reports to help you track your progress during your training and on the path to licensure. To view these reports, click the Reports tab in your Time2Track account, then select any of the available reports. The Activity Summary report gives you a quick snapshot of where you are, including helpful charts and graphs. The Demographic Summary report gives you a summary of the different client populations you’ve worked with. You can also print any of Time2Track’s reports for your records or to get physical signatures from your supervisor and/or training director.